Admirable Women – Anonymous Woman Rightfully Objects to Muslim Prayer Service in Christian National Cathedral in D.C. | It's the Women, Not the Men! 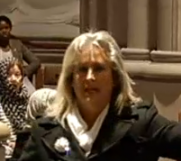 Admirable Women – Anonymous Woman Rightfully Objects to Muslim Prayer Service in Christian National Cathedral in D.C. Unfortunately, the brave woman from Michigan, who was provoked to speak out, when Rev. Canon Gina Gilland-Campbell invited Muslims to pray in the Episcopal Church in Washington, D.C., has yet to be identified. I wish I’d been there with her when she righteously interrupted the group of Muslims, not praying to God in the Christian church, but to Allah. And, where Ms. Rev. Campbell had all of the crucifixes covered, so as not to offend the Muslims! As Muslims are slaughtering Christians throughout the world, and in America, this female minister’s “gesture” is nothing more than “ecumenicalism” gone mad! And, just in case you’ve been living under a rock, this next video gives a brief overview of the vicious “progress” Muslims are making in their violent fight to replace Democracy and Christianity here in America, and in Europe, with Sharia Law. It’s chilling. I wonder when Ms. Campbell is bringing her congregation to the local mosque to pray to Jesus? Oh. That wasn’t part of the deal? WHY NOT? Why not? because Muslims won’t let Christians enter their mosques and “defile” them with their presence! Someone should have shown Ms. Campbell the following video before she jumped off the cliff. Update: We now know that the brave woman at the center of this scenario was Christine Weick. Please pray for this incredibly devote Christian. Disturbing when church leaders are compromising…. The problem stems from radical feminists. God the Father never intended women to be the leaders of men and Jesus never intended women to lead His church. These female “ministers” are frauds from the get-go. Nothing they do from that point forward makes sense because, in order for them to have considered becoming a Christian minister means that they are primarily a radical, second-wave feminist FIRST and Christians second, if at all! Christianity and feminism cannot coexist within an individual, nor for that matter, within a culture. There can only be one winner in this ideological war because feminism and Christianity are diametrically opposed to each other philosophically. Read my post, “10+ Tenets of Christianity vs. 10+ Ideals of Radical Feminism” to see why this is so. LOl …. good one, Dale. It figures- a woman “pastor” was responsible for the whole deal! Women being pastors is rebellion against God, and rebellion is as the sin of witchcraft!